The International Air Transport Association (IATA) has released the latest edition of its Dangerous Goods Regulations (DGR) which came into force on 1st Janaury 2018. This edition, with its addendum, introduces yet more changes to the requirements for the transportation of dangerous goods. IATA publishes a new edition of the DGR towards the end of every year, with each new edition taking effect on January 1st of the following year. 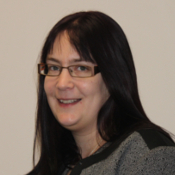 Caroline Raine, NCEC's regulatory expert, outlines some of those changes and also what we can expect from 2019. What are the significant changes and amendments to the 59th edition? Limitations have been adopted on the number of portable electronic devices (PEDs) and the number of spare batteries for PED that may be carried by passengers or crew. The limit is a maximum of 15 PEDs and 20 spare batteries. These maximums may be exceeded but only with the approval of the operator. There are also new restrictions on packages containing lithium batteries (UN 3090 and UN 3480 only) being placed into an overpack with packages containing dangerous goods classified in Class 1 other than Division 1.4S, Division 2.1, Class 3, Division 4.1 or Division 5.1. An additional note has been added to identify that lithium batteries (UN 3090 and UN 3480 only) are not permitted in the same outer packaging with dangerous goods classified in Class 1 other than Division 1.4S, Division 2.1, Class 3, Division 4.1 or Division 5.1. Lithium Batteries: Portable electronic devices containing lithium metal or lithium ion cells or batteries, including medical devices such as portable oxygen concentrators (POC) and consumer electronics such as cameras, mobile phones, laptops and tablets, when carried by passengers or crew for personal use (see 2.3.5.9). For lithium metal batteries the lithium metal content must not exceed 2 g and for lithium ion batteries the Watt-hour rating must not exceed 100 Wh. Devices in checked baggage must be completely switched off and must be protected from damage. PI 965 and PI 968 – Text has been added to identify the restrictions on packing lithium batteries (UN 3480 and UN 3090 only) in the same outer packaging with dangerous goods classified in Class 1 other than Division 1.4S, Division 2.1, Class 3, Division 4.1 or Division 5.1. There are also restrictions on placing packages containing lithium batteries (UN 3090 and UN 3480 only) into an overpack with packages containing dangerous goods classified in Class 1 other than Division 1.4S, Division 2.1, Class 3, Division 4.1 or Division 5.1. These restrictions apply to Section IA and IB. For Section II, cells and batteries must not be packed in the same outer packaging with other dangerous goods. A recommendation has been made that the UN number(s) printed on the lithium battery mark should have a minimum size of 12mm. Table 9.3.A and the provisions of 9.3.2 have been revised to introduce segregation requirements for lithium batteries (UN 3480 and UN 3090 only) and dangerous goods classified in Class 1 other than Division 1.4S, Division 2.1, Class 3, Division 4.1 or Division 5.1. This aligns with the changes in 5.0.1.5, 5.0.2.11 , PI 965 and PI 968. A note has been added statingto identify that the segregation of packages and overpacks loaded into unit load devices (ULD) and aircraft cargo compartments, while recommended as of 1 January 2018, will not become mandatory until 1 January 2019. In Appendix B.2.2.4 new Cargo IMP codes have been added for UN 3090, Section IA and IB of PI 968-RBM and UN 3480, Section IA and IB of PI 965-RBI. These two new IMP codes facilitate the differentiation of fully regulated lithium batteries (UN 3090 and UN 3480) from those packed with equipment or contained in equipment (UN 3091 and UN 3481), which are currently assigned to RLM and RLI respectively. If a document (such as a bill of lading or air waybill) accompanies dangerous goods in excepted quantities, it must include the statement ‘Dangerous Goods in Excepted Quantities’. It must also indicate the number of packages, unless these are the only packages within the consignment. This information must be shown in the ‘Nature and Quantity of Goods’ box on the air waybill . The Cargo Aircraft Only label has been updated. The border is now to be shown in orange. The lithium battery mark is required as specified in the additional requirements of Section II of packing instructions 965, 966, 967, 968, 969 and 970. It is also required as specified in the additional requirements of Section IB of packing instructions 965 and 968 in addition to the Class 9 lithium battery hazard label and Cargo Aircraft Only label. 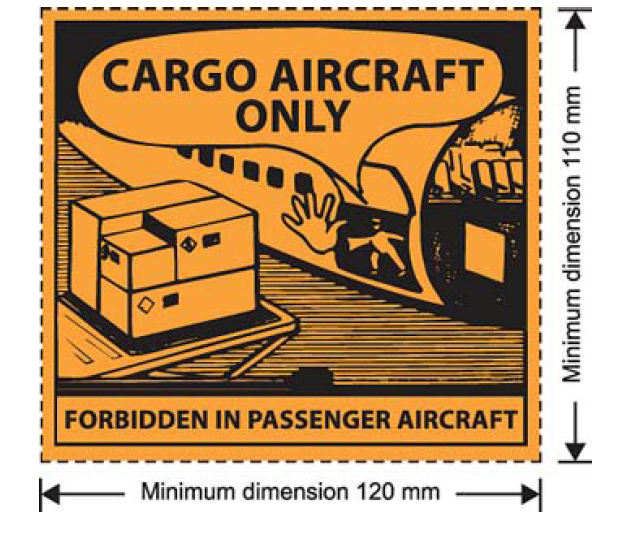 The mark is as shown in Figure 7.1.C of the IATA Dangerous Goods Regulations. The border of the label must have red diagonal hatchings with text and symbols in black on a white or contrasting background. The lithium battery mark may be printed directly on the outer packaging provided that there is sufficient contrast between the elements of the lithium battery mark and the colour of the packaging material. The minimum dimensions are 120 mm wide x 110 mm high. Note: The lithium battery handling label as shown below, may continue to be used until 31 December 2018.
" The telephone number should be of a person knowledgeable about the shipment but is not intended to be for the purposes of obtaining immediate emergency response guidance, and is therefore not required to be monitored at all times that the package is in transit. It is acceptable for the number to be monitored during the company’s normal business hours in order to provide product-specific information relative to the shipment. However, it also is acceptable to use an emergency response, 24-hour phone number on the label." What changes should we expect from 01 January 2019? There will be a number of changes relevant to lithium batteries that will come into effect as of 01 January 2019, based on the adoption of the changes arising from the 20th revised edition of the UN Model Regulations, as well as the changes that have been agreed to date by the International Civil Aviation Organization (ICAO) Dangerous Goods Panel for inclusion into the 2019-2020 edition of the Technical Instructions. Replacement of most instances of the word “risk” by the word “hazard”. The changes reflects the increasing use of safety management systems where “risk” is the likelihood of an event combined with the severity of the outcome, whereas hazard is used to identify the inherent properties. So, for example a substance may have a “subsidiary hazard”, not a “subsidiary risk”. A new requirement for manufacturers and subsequent distributors of lithium cells or batteries to make available a summary of the UN 38.3 tests. Removal of the lithium battery handling label (7.2.4.7). As of 1 January 2019 only the lithium battery mark (7.1.5.5) will be permitted on packages of lithium batteries prepared in accordance with Section IB of PI 965 or PI 968, or Section II of PI 965 to PI 970. If you're unsure about what this means for you and your shipments, contact our team who will be happy to help.